This month's Albuquerque DFA-DFNM Meetup is set for tonight at 7:00 PM at the Social Hall at the First Unitarian Church on the SW corner of Carlisle and Comanche. We're pleased to have as our special guest PRC Chairman Ben Ray Lujan, a Democrat who's running for Congress in NM-03. We'll also hear from Irene Parra of Big Brothers, Big Sisters and discuss the upcoming New Mexico Legislative Session that begins at Noon on January 15th. To sign up for the group and/or RSVP for tonight's Meetup click here. Should be another lively get together of Albuquerque's progressive grassroots. MICHELLE LUJAN GRISHAM, Dem candidate for Congress in NM-01, will discuss her candidacy and answer your questions. We'll also hear from GEORGE KRAHE, representing Martin Heinrich for Congress, and meet new Family Court Judge ELIZABETH WHITEFIELD. BILL and ANNE KASS will give what should be a very compelling Power Point presentation about their recent trip to VENEZUELA. Talk about perfect timing, with news about the Venezuelan election results all over the media. IMPORTANT: TERRY RILEY will bring the Democratic Party of New Mexico's KICKING DONKEY FLOAT to Meetup, decorated with holiday lights. He'll be gathering clothing, food, personal items and monetary donations for the Veterans Reintegration Center project organized by the Democratic Party of Bernalillo County, so bring your donations to the meeting if you're attending. Our Dem County Chair Ana Canales asked me to encourage you to donate holiday wrapping paper and tape so the presents to the Vet Center can be wrapped. You can read more about the Party's vet center donation project here. See below for a list of other items you can donate to the cause. Personal toiletries: deodorant, shampoo, soap, toothpaste, lotions, toothbrushes, combs, shaving lotion, razors, etc. Towels: new or gently used please!! We would like one bath towel, one hand towel, and 2 wash clothes per person in each box. Socks, slipper socks, and underwear- various sizes and types will be fine. Gloves and caps- one size fits all will be best. Sweatshirts, sweaters, and/or flannel shirts, various sizes. Stationery, first-class stamps, envelopes, and long-distance phone cards. Home-made cookies, brownies, etc. No store bought!! DONATED CASH WILL BE USED TO PURCHASE COATS FOR THE MOST NEEDY RESIDENTS. You can also bring donations for the Veterans Integration Center to Dem Party HQ at 1301 San Pedro NE, on weekdays before 12/20 from 9AM - 5PM, or to the County Party's Third Thursday Meeting and potluck at 6:00 PM on December 20 at the Plumbers and Pipefitters Hall at 510 San Pedro SE. All are welcome! In a November post we announced a project organized by the Democratic Party of Bernalillo County to benefit the New Mexico Veteran's Reintegration Center in Albuquerque. The project has now been expanded in scope, and donations of food, clothing and other needed items -- as well as cash donations -- are being collected for presentation to the Center and its 75+ residents on the evening of Thursday, December 20, 2007. See below the fold for a list of items being sought. The Democratic Party of New Mexico's kicking donkey float -- festooned with holiday lights -- will be driven by Terry Riley to both the December 6th Meetup and the December 20th DPBC Third Thursday Meeting to collect donations (see panel above). After the Third Thursday Meeting, well-wishers will accompany the float to the Veteran's Reintegration Center to make the presentation. In keeping with the spirit of the holiday season, and the DNC “7 in 2007” activities (which are suggested to include a Democratic sponsored service project) the Democratic Party of Bernalillo County has selected the Veterans Reintegration Center at 6101 Central Ave NE as the recipient of our service project efforts. The Veterans Reintegration Center provides housing, food, and job training for returning vets, especially those who are homeless. There are approximately 75 men and 5 women housed at the center. The plan: All of us collect money and needed items between now and December 20. Bring these items, and cash, to the 3rd Thursday potluck dinner on December 20, 6 PM, at the Plumbers and Steamfitters Hall, 510 San Pedro Blvd. S.E. (or bring to party headquarters at 1301 San Pedro NE if you are unable to attend the dinner or to the DFA-DFNM Meetup on December 6 at the First Unitarian Church). Following a wonderful shared potluck dinner and visiting with each other, we will then spend an hour or two putting together our gift boxes and wrapping them. The State Party kicking donkeys float will be used to deliver the gifts that evening. · Personal toiletries: deodorant, shampoo, soap, toothpaste, lotions, toothbrushes, combs, shaving lotion, razors, etc. · Towels: new or gently used please!! We would like one bath towel, one hand towel, and 2 wash clothes per person in each box. · Socks, slipper socks, and underwear- various sizes and types will be fine. · Gloves and caps- one size fits all will be best. · Sweatshirts, sweaters, and/or flannel shirts, various sizes. · Stationery, first-class stamps, envelopes, and long-distance phone cards. · Home-made cookies, brownies, etc. No store bought!! DONATED CASH WILL BE USED TO PURCHASE COATS FOR THE MOST NEEDY RESIDENTS! THANK YOU FOR YOUR GENEROUS SPIRITS AND WARM HEARTS! I talked with Dem U.S. Senate candidate Don Wiviott last night and we discussed what a powerfully positive affect Domenici's retirement (and those of other Republicans) will have on the effort to end the Iraq occupation, deal responsibly with our economic problems and inequities, and redirect our energy towards an environmentally sustainable future. Wiviott said it was a great day in terms of improving our chances to move the Democratic agenda forward to bring much-needed change to benefit the country and the planet. Wiviott had the courage to get into the race and organize a serious campaign when others in the state were afraid to stick their necks out. He spent July and August putting together a run, started raising money around Labor Day and is now hard at work finalizing his campaign team and materials. Now that Domenici is retiring, he seems even more determined to work hard to win a chance to take on the Republican candidate next Fall. He said unequivocably that he's in the Senate race to stay and will take on all comers in a Democratic primary. He's pledged to raise up to $2.1 million to spend in a primary if necessary, and he's already seeded his campaign with $400,000 of his own money. He's that passionate. You can judge for yourself by attending tonight's DFA-DFNM Meetup at 7:00 PM at the Social Hall of the First Unitarian Church on the SW corner of Carlisle and Comanche in Albuquerque. Wiviott will speak and participate in a Q and A session. To join the group and/or RSVP for tonight's event click here. I certainly share Don's enthusiasm about the Dems' chances to gain Senate seats next year, including here in New Mexico. Even though Domenici recently expressed some criticism of Bush's Iraq tactics, he's really still a true believer in everything Bush. With Domenici retiring, we have a real opportunity to replace a supporter of the Bush agenda with someone who will work to regain our positive momentum. The Dems now have an even better chance to win in the neighborhood of 4-6 Senate seats in the 2008 election -- or maybe even more. Open Senate races are also shaping up in Viriginia (Warner retiring), Nebraska (Hegel retiring), Colorado (Allard retiring) and Idaho (Craig reportedly retiring). Plus a number of incumbent Republican Senators running for reelection in Dem trending states have tumbling approval numbers due to their support of the Bush agenda. These include Susan Collins (ME), Gordon Smith (OR), John Sununu (NH) and Norm Coleman (MN). Repubs also have to defend 10 more Senate seats than the Democrats do in '08. It could be a very good year for starting to turn the floundering ship of state around. 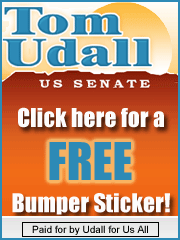 To read more posts about the U.S. Senate race in New Mexico, visit our archive. Photo at top by M.E. Broderick. He has agreed to a full hour with our group and will have a question and answer segment with us. We can ask him the hard questions and express our concerns. We look forward to seeing you at our intimate conversation with Don Wiviott. To join the Albuquerque DFA-DFNM Meetup group or RSVP for Thursday's Meetup click here. If you plan to attend, please RSVP so we can set up the room appropriately. Thanks. Our monthly Albuquerque DFA-DFNM Meetup is set for Thursday, September 6th at 7:00 PM at the Social Hall of the First Unitarian Church at Carlisle and Comanche. To RSVP or join our group and email list, click here. Our special guest will be State Senator Jerry Ortiz y Pino, one of the progressive stalwarts in the New Mexico Legislature. Sen. Ortiz y Pino was a primary sponsor of resolutions urging the Congress to impeach Cheney and Bush and immediately bring our troops home from Iraq, as well as bills to establish a Department of Peace and create a working families tax credit. He's been a strong supporter of legislation needed in the areas of social welfare, at-risk youth, health, vets, education and many other core Democratic issues. 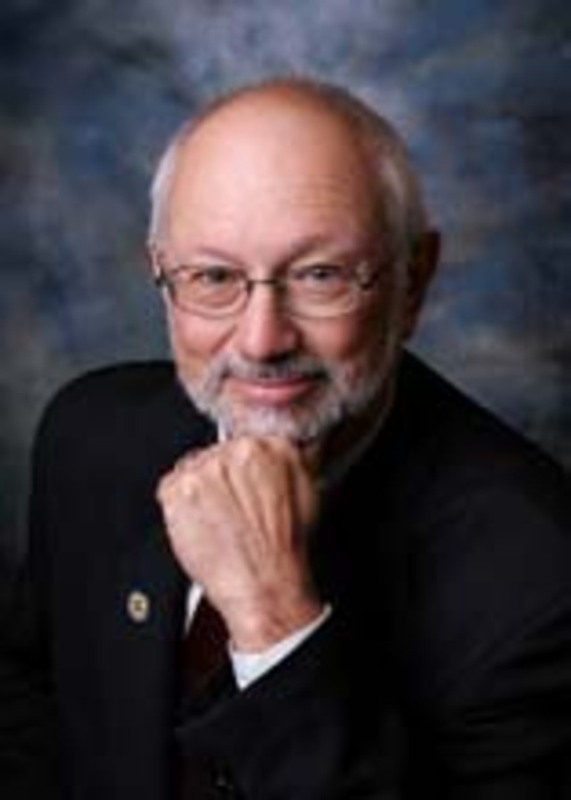 Sen. Ortiz y Pino was elected to represent State Senate District 12 (most of downtown Albuquerque and surrounding neighborhoods) in 2004, after retiring from a career in state and local government in a variety of social service posts. In 2004, he also started work at HELP-NM as director of the family services division. Since 2001, he's written a regular newspaper column on political and social issues for the Weekly Alibi. He's worked throughout New Mexico but spent the past 28 years in Albuquerque. His interests broadened over the years from an initial focus on mental health and children's protective services to work in child and family advocacy, substance abuse, positive youth development and early childhood programming. With two other social workers, he helped found a private adoption and foster care agency called La Familia in 1984 and co-founded a Charter High School for dropouts in Albuquerque in 2000 -- the Robert F. Kennedy Charter High School. He also helped found Los Puentes and Cesar Chavez Charter High Schools in Albuquerque and Cesar Chavez in Deming. All primarily serve adolescents who have left mainstream high schools. Sen. Ortiz y Pino has a BA in Latin American Studies from the University of New Mexico and a Master's in Social Work from Tulane University. Heinrich was the keynote speaker at our DFA-DFNM Meetup earlier this month and by all accounts wowed the crowd with his intelligent, knowledgeable positions, his forthright and articulate answers to questions from attendees and his enthusiasm to take on Wilson. Not only that -- but when he didn't know an answer, he admitted it and pledged to do the necessary research. Imagine that. Honesty on the stump! Asked what he was most proud of during his prior four years as City Council President, Heinrich cited the Council's successful passage of a raise in the city's minimum wage, but stressed that more should be done to make sure the wage rises with inflation. He also pointed to ethics reform achievements, including voluntary public funding for candidates in municipal elections and a tightening of rules about City contracting. Saying he's working within a broken election system that relies on candidates raising large sums of money, he pledged that he'd work for public campaign financing nationwide if elected. Why is he running? So that he can have some hope for his kids and the world they'll inherit. In that vein, he said he strongly supports an "Apollo project" to achieve energy independence by speeding green technology advances and a switch to renewable energy sources. Commenting on how far ahead other nations are in this change, he noted that almost 100 percent of the products produced by Albuquerque-based Advent Solar will go to Germany, even though we have much more sun. Asked about nuclear power, he said that we shouldn't be viewing it as the answer or as a magic pill. We need to subsidize and generously fund the future in terms of new technologies, not the past. As for the Iraq occupation, Heinrich said he believes that Congress mishandled the supplemental appropriation bill and that Dems should have kept putting their bill back into the President's lap after he vetoed it because of the troop redeployment requirements. He agreed that our troops need to come home as quickly as an orderly drawdown can be achieved, and said that Dems need to remember that leading with their values will lead to respect. Regarding healthcare, Heinrich stressed that it's a basic human right and that Medicare is an excellent model because everyone is in the same insurance pool. He praised the current federal SCHIP bill that would greatly expand Medicaid healthcare coverage for children and noted that Heather Wilson voted against it and with Bush and the tobacco companies. He said he thinks a new approach is needed in financing healthcare and that the free market cannot solve all problems, especially in areas like healthcare. Asked if he would support impeachment of Bush, Martin said we should start by impeaching Alberto Gonzales and take it from there. Heinrich said No Child Left Behind should be repealed but funded in the meantime. We need to teach kids to think, not just take tests, he said. After Heinrich finished answering questions, Meetup attendees were so motivated to contribute to his campaign that additional donation envelopes had to be retrieved from his car when the original supply proved insufficient. That's putting your money where you mouth is -- something we have to keep doing if we want Martin to clear the field and be the Dem nominee. If you'd like to help Heinrich keep his big mo' building, kick in a few bucks for his campaign at the DFNM Netroots page at Act Blue. Three other contenders for the Dem nomination in CD1 have come forward in recent weeks. Bryon Paez, who works for the powerful NM lobbying firm run by the Guv's friend, Bruce Maki, has said he intends to enter the race. Attorney Jon Adams has also tossed his hat in the ring. According to Kate Nash at the Albuquerque Tribune, Adams raised $10,000 in campaign cash during the first week of his campaign. Most recently, Jason Call has announced his entry into the race as a "small d independent democrat." To read previous posts on the NM-01 Congressional race, visit our archive. Thanks to EB for taking such good notes at the Meetup with Heinrich while I was at YearlyKos in Chicago. Photo credit: M.E. Broderick. Our next regular monthly Albuquerque DFA-Democracy for New Mexico Meetup will feature special guest MARTIN HEINRICH, the Democratic candidate for Congress in NM-01 who'll be challenging Republican incumbent Heather Wilson. We'll hear about Martin's platform and strategies and have a chance to ask him questions or offer comments. Gabriel Nims of is also scheduled to stop in and, as usual, there'll be a few other announcements and info. Don't miss this Meetup. Come to the Social Hall of the First Unitarian Church on the SW corner of Carlisle and Comanche in Albuquerque at 7:00 PM on Thursday, August 2nd. Click to join our Meetup group, RSVP or get on our email list. Mark Your Calendars: Our September 6th Meetup will feature NM Senator Jerry Ortiz y Pino as our keynote speaker so mark your calendars now. He's expected to talk about what's coming at the next NM Legislative Session and provide some perspective on what happened at the last one. Sen. Ortiz y Pino has sponsored many excellent pieces of progressive legislation, including the NM Senate resolution to impeach Bush and Cheney. 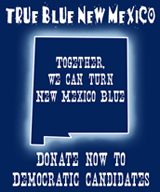 Note if you haven't yet donated to Martin Heinrich's campaign, you can do so at the DFNM Netroots page at Act Blue. As we mentioned at the last Meetup, we're cancelling our Albuquerque DFA-DFNM Meetup scheduled for July 5th due to the Independence Day holiday week. Our regular Meetup schedule will resume on August 2nd when our confirmed guest speaker will be Congressional candidate Martin Heinrich. He'll be talking about his campaign and platform, as well as taking your questions. Mark your calendars! If you'd like to join our group and email list, visit our Meetup page. Park entrance is near Tramway & Academy. If you're going North on Tramway, take the first right North of Academy, which is Simms Park Road. Go 1/2 mile to entrance and follow signs. Tell them you're going to the Dem Picnic and the entry fee will be waived. Feel free to bring your own food or side dishes, salads, desserts, water, etc. The turnout was so good at the last picnic that the Party ran out of food! Click for more info at the . NOTE: I'll be keeping this post at the top of the page until the fundraising quarter is over at Midnight tonight, June 30th. Please donate if you can. Martin's campaign needs to demonstrate it has the backing of as many people as possible to make it clear that he's the best Democratic candidate to take on Heather Wilson in 2008. Even a $5 donation helps. 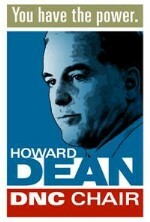 Remember how Howard Dean outraised all his competitors based on hundreds of thousands of small donations? Let's help Martin Heinrich do the same. You can also sign up for automatic monthly donations, if you'd prefer, which spreads the expense over time so you can afford it. We know that Heather Wilson will have millions of dollars to try and "Swiftboat" Martin Heinrich. Let's help him build a strong campaign so he can stand up to Heather and provide representation that we can be proud of!